Custom e-stores, with shopping carts and electronic payment. Controls for sorting, searching, and filtering catalog data. Administration tools that let site owners update content on their own. Tools to maintain mailing lists, and create and send out newsletters. Contact forms to avoid the harvesting of email addresses by SpamBots. Capture of data from Web forms. NormalEating.com hosts a members-only forum with fully automated payment using PayPal's Instant Payment Notification feature. The forum is an extensively customized version of Simple Machines Forum (SMF), written in PHP. 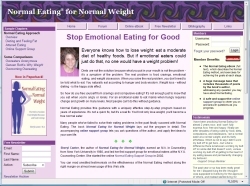 The site also sells my book, Normal Eating for Normal Weight (available through Amazon.com and other outlets, as well). e-Commerce site selling shareware. Database driven and dynamic; adding a program to the database generates new pages automatically. Custom shopping cart. Sorting and searching support. On site YaBB-SE Web forum. Built with PHP and MySQL. Web site for Vermont State Represenative Steve Darrow. Contains background information, links to articles by and about Steve, community links, and a contact page with a custom form mail program written in PHP. Replace you@domain.com with your email address. Astrology software site. Web-based version of the astrology program (shown here) is in beta testing. Web program written in C and compiled as a CGI for Linux. Windows version of the software is also in beta testing.